I thought I'd share this here - it didn't seem right to included paper minis in a real miniatures section. PIG-FACED ORCS! Now in colour! Okay, if you're an old-schooler, a fan of AD&D, or of the earliest Basic editions, you'll be no stranger to the pig-faced orc. 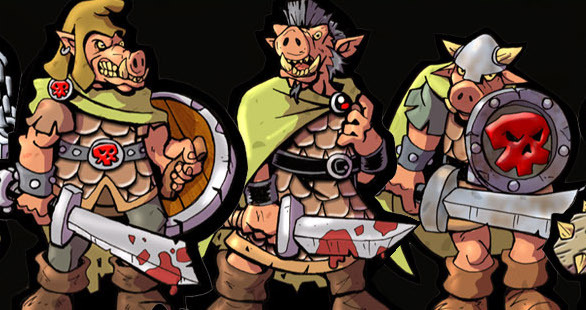 Whether or not I believe orcs should have snouts is now completely ambushed in my nostalgia addled mind by the fact that they represent illustrations from those games. David Okum's Orc Tribe is a sheer pleasure to behold. It's a great mix of caricature and chunky costume details. The PDF containing these printable figures also gives the player the option to select different colour capes and armour with different layers. 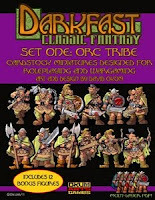 I'm really looking forward to other figures from this "Darkfast Classic Fantasy" range. Perfect for acolytes of the OSR. 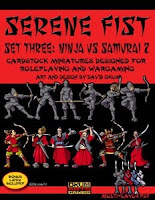 Another Okumarts favourite of mine is this pack with ninjas and samurais (plural of samurai? not latin like octupi...). This is mainly because I'm reading (S&W Whitebox) Ruins & Ronin rules at the moment, so I'm a complete sucker for quality medieval-Japanesey stuff. Again, there's an option to change colours using the layers menu.